Sonevytsky, Mykhailo [Соневицький, Михайло; Sonevyc'kyj, Myxajlo], b 22 April 1892 in Hadynkivtsi, Husiatyn county, Galicia, d 30 November 1975 in New York. Classical philologist; full member of the Shevchenko Scientific Society from 1954; father of Ihor Sonevytsky and Leonid Sonevytsky. 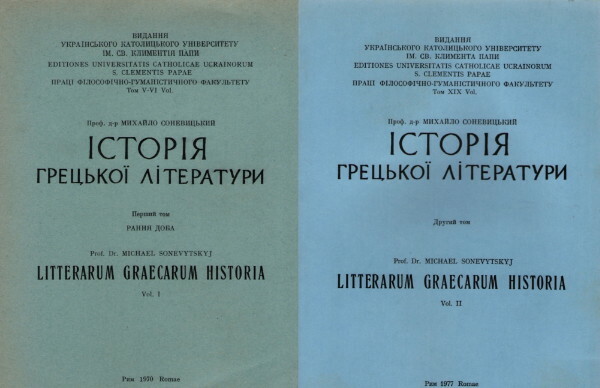 After studying at Chernivtsi University (1910–11) and Vienna University (1911–14; PH D, 1923) he taught Latin, Greek, and classical literature at Ukrainian gymnasiums. A displaced person after the Second World War, he emigrated to the United States in 1950, and from 1963 was a professor at the Ukrainian Catholic University in Rome. He is the author of the children's books Pryhody Odysseia (Odysseus’ Adventures, 1918), Myrmidons'kyi lytsar (The Mirmidonian Knight, 2 parts, 1936), and Homin davnomynulykh dniv (The Echo of Days Long Past, 1938; repr 1955); a history of classical Greek literature (2 vols, Rome 1970, 1977); a Ukrainian translation of Xenophon’s Anabasis (1986); and popular articles on classical culture and pedagogical subjects in Zhyttia i znannia and Ukraïns’ka shkola (1936–9).